If you are interested in becoming an IMVU Developer there are several pieces of software that will help you through the process of taking your designs from concept through to a finished product. Below we have listed several options for computer applications that could do the job for you. Although in-house we use many of the industry standards (which can be expensive to a first time user), we list several less pricey alternatives. 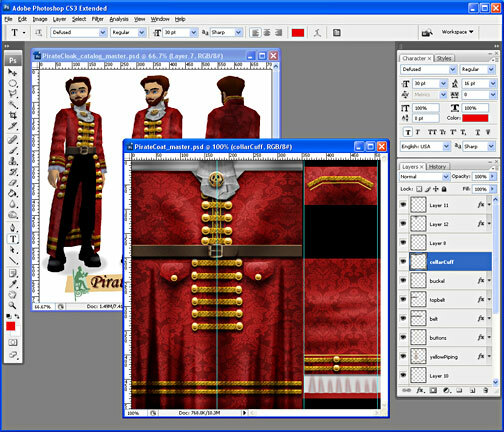 The Create Mode Editor is the proprietary IMVU tool for getting your 3D models into the IMVU Catalog. 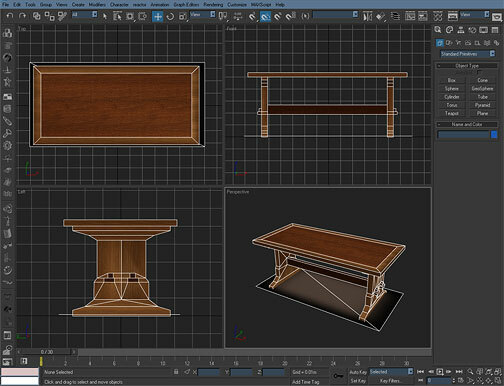 Whether you are swapping textures on a t-shirt or creating you own 3D Mesh, you will need the Editor to import, arrange, and finally Submit your design to the Catalog. To learn more about the IMVU Create Mode Editor, check out the Intro to the Create Mode Editor tutorial. You can find the Create Mode Editor by clicking the Create button in the IMVU main screen, just click one of the arrows access Create from the main button selection. This will load the Create Mode main screen and give you options to start building your own IMVU products. Whether you are making a texture for a 3D model, a Sticker, or just customizing your Homepage, you will be using some sort of 2D application to create and manipulate your digital images. Although Photoshop is the acknowledged industry standard, it isn’t necessarily your only choice. Photoshop is what we use here at IMVU, and is by far the most powerful image manipulation software out there, but if you have limited funds you might need to look for alternatives. Visit our Software We Support (2D) article to learn more! At its core, IMVU is a 3D environment filled with 3D people and places. To create the 3D products that fill IMVU’s Catalog, Developers have used a variety of applications and tools to take their designs from purely conceptual to purchasable. Best of all, these virtual products never run out of stock. In addition, with the ability to Derive from products, your seed of an idea might just inspire other Developers to build countless new products from yours, all of which you get a small cut from each sale. Visit our Software We Support (3D) article to learn more!